Lederhosen, beer festivals, a Swiss Alps village, and wine tasting. Is Leavenworth Bavarian for wine? From a logging and rail town on the brink of extinction to a town that boasts over a million visitors a year, Leavenworth is the example of how hard work and determination can lead to a renewed direction. In the 1960’s Leavenworth was a town struggling to survive until the town residents made the collective decision to brand their area as a Bavarian village. Armed with determination and their own funds, Leavenworth residents transformed the dying town into a thriving tourist spot. Now, people of all ages come to enjoy the town for its outdoor activities (skiing, rafting, hiking) and to be whisked away to a faraway place where the day starts with the blow of the alphorn and even the McDonalds is decked out in Bavarian theme. 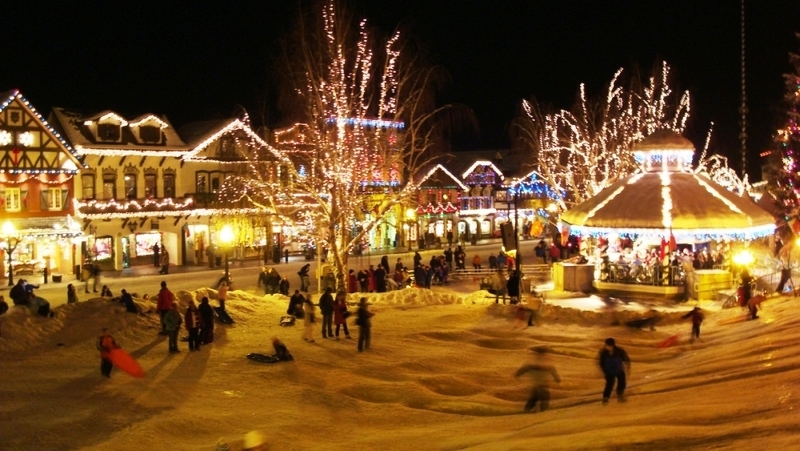 For many, Leavenworth is a magical getaway from the hustle of the big city. Situated on Highway 2, the town is 2.5 hours from Seattle and 3 from Spokane. Visitors flock to Oktoberfest, Christmas Lighting Festival, Maifest and many other events. Now, with nearly 20 wineries and wine tasting rooms, there is also the lure of the grape. A quick glance of the annual events shows the Leavenworth Wine Walk in June and the Leavenworth Wine Tasting Festival in August. 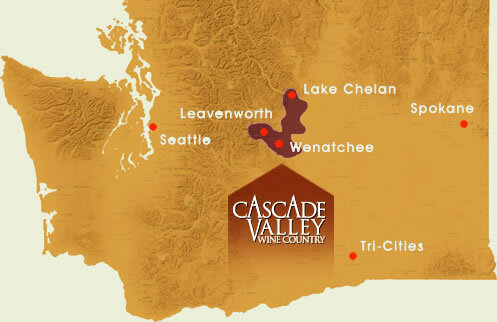 Leavenworth, along with Chelan and Wenatchee are part of the Cascade Valley Wine Country. During a recent trip, I had the opportunity to visit all three areas. This visit only included stops at four of the area wineries, but we did have the opportunity to taste wine from four others. With familiar names like Kestrel, and Ryan Patrick, the downtown core of Leavenworth is dotted with wine tasting rooms. Other familiar names and newcomers, Icicle Ridge, Wedge Mountain, and Silvara, sit nestled in the mountains surrounding Leavenworth and Peshastin. One winery of critical acclaim that we did not get an opportunity to visit is Boudreaux Cellars. “Off the power grid and hundreds of miles from the vineyard sources he prefers, (Rob) Newsom has built a spectacular, unique facility while learning his craft well.” ~ Paul Gregutt, Washington Wines and Wineries Second Edition (4 Star Wineries) A visit to Boudreaux Cellars will be on the list for the next visit. If you like stories, jazz music, and wine, you’ll love a visit to Icicle Ridge. Producing about 6000 cases of wine a year, all of it distributed from their two tasting rooms, Icicle Ridge is one of the wine pioneers in Leavenworth. 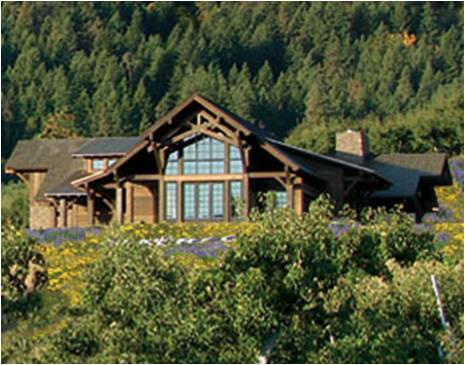 Founder Louie Wagoner (King Louie to his friends and family) and winemaker Don Wood have created a unique destination out of the 5000 square foot log home that doubles as a tasting room and events space. Icicle Ridge makes a large number of wines that include Peach and Huckleberry Rieslings, a big Syrah, and even some sparkling wine. During the summer months visitors are treated to a jazz music series on the lawn that overlooks their 9 acres of vineyards. King Louie is an avid collector of classic cars and chances are you’ll see him firing up an old 1920 circa Ford truck or a mid-50’s Chevy. In the midst of the stories and the tour we enjoyed three wines; 2008 Vintners Reserve Cabernet ($50); Muller Thurgau Sparkling Wine ($55); and a 2009 Sangiovese right from the tank ($ TBD). The wines were well made with the Sagiovese offering tons of bright acidic cherry fruit and spice being my favorite. Icicle Ridge is a must stop on your Leavenworth visit but in this visitors opinion, the wines were significantly overpriced. Highly Recommend for the experience but be prepared to part with some serious cash. The biggest pleasant surprise of the Leavenworth area visit was the stop at Silvara Winery. Silvara is the newest winery in the area. Located just a few minutes East of Leavenworth, Gary Seidler and partner Cindy Rarick jumped into the wine business after becoming friends with people from Leavenworth who were visiting their home state of Arizona. The Silvara tasting room is a grand space with views of the Cascade Mountains. Visitors will enjoy the comfortable fireplace and outdoor seating area while enjoying a bottle of wine. Gary’s plans include continued development of the property grounds where patrons can enjoy live music, stop for a picnic or reserve the space for weddings and events. 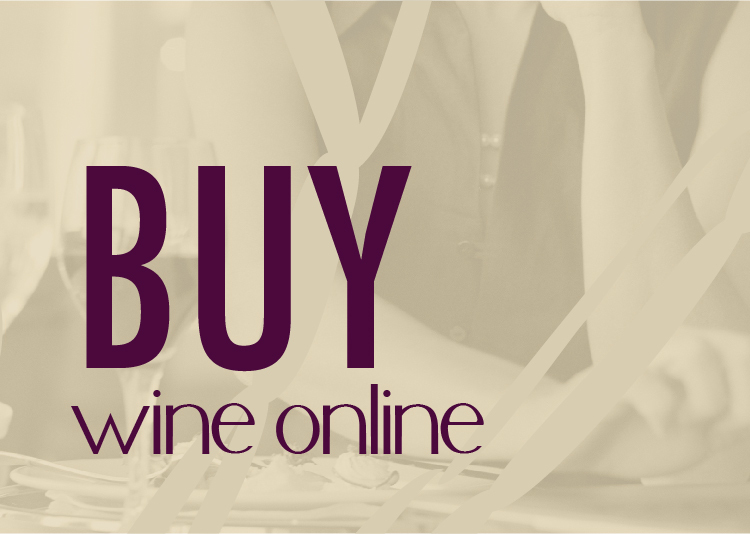 With current production at about 1200 cases, each of Silvara’s wines were priced affordably at $18-$24. Grape sources from Matawa, Quincy and the Wahluke slop help Silvara score high on quality. On Main Street in Pashastin is a small little winery and gift shop that holds some unique surprises. The little building houses the production and distribution for Cascadia Winery, a boutique winery stated in December 2006 by Alan Yanagimachi. Alan earned his degree in Fermentation Science / Enology from UC Davis in 1988 and spent some time honing his craft at Spokane’s Arbor Crest Winery. 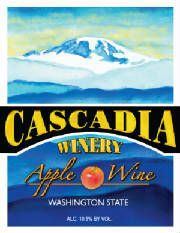 Cascadia produces about 700 cases of Merlot, Cabernet Sauvignon, Chardonnay and two unique treats; Apple Wine and Sakura. The apple wine is made from 2009 Golden and Gala apples and offers a fun tasting experience. The 2.6% residual sugar doesn’t come across overly sweet and the crisp apple flavors are enjoyable. At only $12 this is Cascadia’s largest seller. The Sakura, “Japanese for cherry blossom,” is made from a cherry infused Merlot. The wine is very sweet, but very enjoyable in small quantities or as a reduction for cooking. The highlight wine was the 2006 Merlot. Stop by if you’re curious to try the apple wine and Sakura. Eagle Creek owner, Ed Rutledge was our Leavenworth tour guide for the weekend. Ed and his wife Pat are town ambassadors and own several businesses on main street. Founded in 2000, Eagle Creek is the oldest winery in Leavenworth and Ed is excited about the growth in numbers and quality over the years. 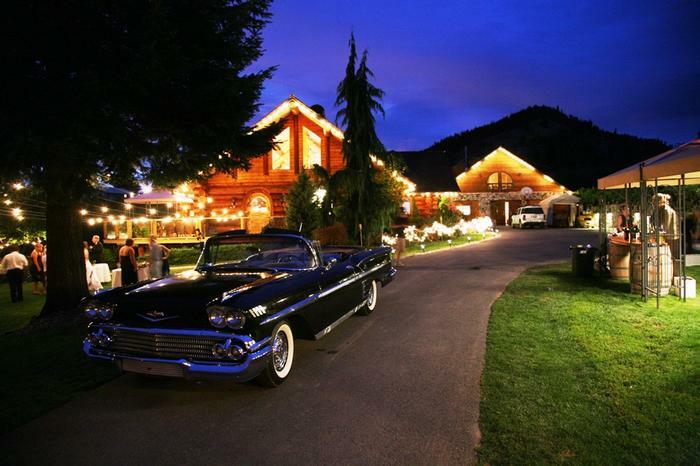 The Eagle Creek production facility, tasting room, bed and breakfast is located about 2 ½ miles north of Leavenworth, but the Rutledge’s opened a tasting room on main street called “D’Vinery” in 2008. Ed “retired” to the northwest after a successful business career and a life in the Big Apple. Obviously not one to sit still long, Ed’s craftsmanship can be seen in his creation of wine, hand carved decorations, paintings and more. If you’re looking for a getaway retreat when visiting Leavenworth, consider the Eagle Creek Cottage. 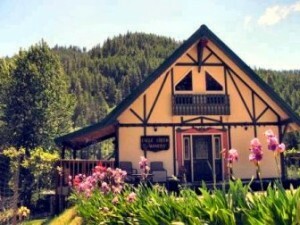 The spacious cottage sleeps 1-6 guests and is tucked away in the hills. Enjoy breakfast on the patio overlooking the 1 acre vineyard and wrap up the evening in the hot tub. 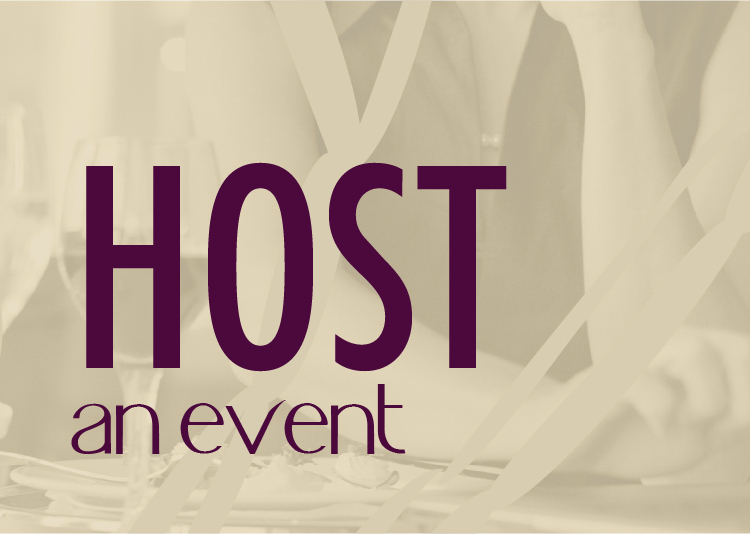 Rates are only $250 per night and include a European breakfast and a bottle of Eagle Creek wine. During the visit I also got a chance to enjoy four other wines made in the area from Wedge Mountain, Napeequa, Bergdorf, and Baroness Cellars. The Wedge Mountain 06 Reserve was a huge wine shimmering of roses and rubies in the glass. Charlie McKee started his winery in 2001 and makes approximately 1000 cases annually. While the wine was nicely made and full of flavor and balance, chances are with only 71 cases made you won’t find it and at $80, you can’t afford it. Bergdorf Cellars treated us to a unique spice wine, their 06 Lemberges Gluhwein. With 7 spices and citrus fruits the spice wine is a perfect companion to nights in Leavenworth, or trips to the hot tub. The Gluhwein makes up about 1/3 of their 3500 case production. The wines that I wish I was able to spend more time with were the wines from Napeequa Vintners. Located 13 miles north of Leavenworth in Plain, WA, Napeequa has been making wine sourced from Yakima Valley and Rattlesnake Hills since 2003. We enjoyed the wines with lunch at Visconti’s in Leavenworth (a dining must for anyone visiting the area). Looking back on my notes, the reserve Malbec ($32) and the Trailhead Red Blend ($28), were very enjoyable. In conclusion, during your visit to the playground area of Leavenworth, you can certainly add wine tasting to your list of things to do. There is enough variety available to appease most any palate. Some of the wines are overpriced and there are some quality struggles from place to place, but you’re on vacation and you’re there to relax, so sip and enjoy! We visited Leavenworth last year. Really fun destination with lots to keep you occupied. I look forward to taking a more wine-centric visit next time. Last year was mostly a beer and fishing trip in the area. Silver Lake left here a couple of years ago. I can’t remember just when. Well, I stand corrected. The recent Leavenworth literature still has them listed. I’ve updated the post to reflect the info. Thanks! 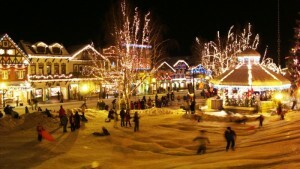 Next time you are going to Leavenworth, drop by our site first to see what is happening in town. We’ve built a site with a whimsical tone from a tourist’s point of view. We have a blog of our travels and things we’ve found there that we like. Oh geez!! What a shame you missed Boudreaux Cellars! Great stuff. Better make sure to hit that one on a special trip perhaps. I know, Adam – I’ve heard such great things. Really bummed that we couldn’t fit that in the trip…next time!